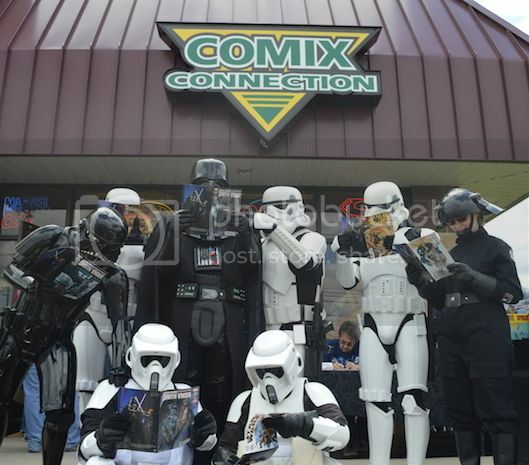 I drove down to Mechanicsburg, about an hour and a half away, to help Comix Connection celebrate Free Comic Book Day. The weather was beautiful - partly cloudy, spring trees full of green, a cool breeze. When I arrived, there was a line wrapped all the way around the outside of the building! From 11-2, I trooped with a group of 3 Stormtroopers, 2 Biker Scouts, a Shadow Stormtrooper, and Darth Vader. We stood outside and greeted people and posed for lots of photos! It was really fun to see them smile. I got to pose for a photo with an amazing little Captain America girl and also talked to a little boy about his trip to Disney. ￼ Afterwards, I got to share pizza with the other troopers and chat about Star Wars movies, games, and things. Everyone was nice, especially my fellow troopers who periodically chatted with me to see how I was doing. They made me feel very welcome. And I have to admit that I was giddy to be hanging out with real stormtroopers, hehe. Not only was this my first troop, it was my first 501st event!